Folks in real life are inclined to think of art as something that hangs in a gallery or museum, or the walls of their apartment. 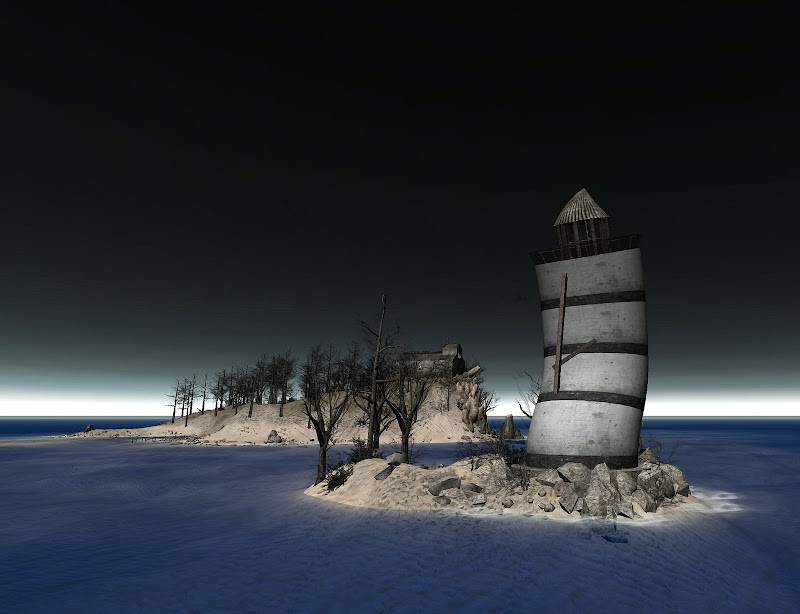 This is hardly necessary in Second Life®, where artists often use entire islands as their canvas. Such is the case with Comet Morigi and certainly with GutterBlood Spoonhammer, a Florida-based 3D rendering and game artist. I would have thought Error - GutterBlood's new sim - an eminently visitable creation without it, but the curvaceous little lighthouse thrills us. His land textures, rocks, and shadows build the illusion of a once lush and verdant place that has been reduced to beachy decay... a desolate, unloved islet. I happened to stumble across this island last week and must say I was amazed! The terrain texture is very cleverly used, and the whole build is pretty amazing. It contains a shopping area as well - which confused me. The whole sim looked a bit too much for being a shop for the handful of items.